Marketers spent 13% more in the second quarter of 2018, driven by click volumes and higher cost per clicks (CPCs). When broken down into regions, the U.S. came in at 12%, followed by the UK at 14%, and Europe at 19%, according to recent data. Digital marketing company Marin Software’s research from its global Q2 2018 Digital Advertising Benchmark Report found that the uptick in the amount spent was driven almost equally by increased click volume and rising CPCs, with the average global CPC increasing from $0.80 in the second quarter of 2017 to $0.85 in the second quarter of 2018. CPCs varied by region and industry. For example, the average CPC in the U.S. and the UK was $0.92, but it was much lower in Europe at $0.42. Amazon captured 24% of digital budgets for Marin clients that were active on that channel for total budgets. Sponsored Product Ads represented 79% of that spend, with Headline Shopping Ads representing the remaining 21%. Shopping Ads from Google represented 32% of the ad spend by retailers. Shopping took the biggest share in the UK at 48%, followed by 37% in European countries and 27% in the U.S.
Instagram proved popular with Marin’s advertisers, taking 20% of their total Facebook ad budgets. While the cost per click (CPC) rose 3% since the first quarter of 2017, averaging $0.184, the CPMs at $3.07 and click-through rates (CTR) at 1.67% dropped slightly from the first quarter of the year. “This difference may relate to recently enacted privacy regulations and increased consumer awareness of highly publicized data breaches — each potentially reducing overall consumer ad engagement on social channels,” according to the report. Overall, among Marin’s clients, Education spent the most in the quarter, followed by Technology, Healthcare, B2B, Healthcare, Finance, Manufacturing, Automotive, retail, and travel. Mobile search ads took 40% share in the quarter. Europe took the highest share 46.4%, whereas the U.S. at 38.4% took the lowest. , a Smaato study found rewarded video CTR is 3.4 times higher than other mobile video advertising -- which sounds fishy, but is actually a positive sign of engagement. For a long time, many in-game rewarded video ads were simply ads for other games, not encouraging for quality brands. But, rewarded video is maturing fast. Smatto also reports that what used to be a format mostly for other gaming ads is now even more popular with retailers and auto brands. Last year, Mary Meeker’s Trend Report cited research that seven in ten consumers prefer a video that gives them an in-app reward. In fact, AngryBirds creators reported a backlash from users when they took rewarded ads out of the game, according to a Gamasutra post. Real time ad-watching means the consumer is engaged in the moment. What’s more, by making a choice to see the ad as a way to enhance what they’re currently doing, they are more open to the advertiser’s message. Digital marketers talk all the time about needing to make sure their messages add value to consumers. Good rewarded video does that inherently. Brands that create campaigns specifically for rewarded video have several good options to consider, depending on how integrated the creative is into the game itself, as well as how relevant the ad is to game play. Integrated in-app: Companies like Supersolid design games with rewarded video in mind. For example, “Food Street” has spaces for billboards right on the game’s streets, which are fun to interact with. Ad-watching fits seamlessly into game play, which means the ads rival the most premium custom inventory from any comScore 200 website. Midplay Rewards: Another similar in-app category includes stopping the game to watch an ad in order to get a new life, more coins or other token in exchange. While the game itself might not be designed to showcase ads, good developers can time the ads very well, such as when a player is selecting a character and has the option to upgrade. Paywall or Freemium Content: For content companies like Forbes and Business Insider, having consumers watch an ad in exchange for premium content is a welcome alternative to requiring subscriptions or offering a cluttered article full of banners and pop-ups. The best inventory in this category really does give consumers access to better content, and to a cleaner viewing experience. Beyond these categories of good options are plenty of placements that won’t perform as well, and might not be worth the investment. For example, there are apps that bombard consumers with too many ads, sites that simply pay consumers to watch video with no content or game attached, and fraudulent offerings that use bots. Like any other part of a media plan, learning a bit about the developers and publishers goes a long way to mitigate any problems. Using the right measurement metrics can also help. Sites or apps that sign up many people for an offer very quickly should be paused and double-checked. Reports of little engagement, but a lot of scale, are another red flag. It's also important to add fraud monitoring to in-app campaigns, such as that from Protected Media or Forensiq. Rewarded video has a lot going for it. With engaged consumers, response rates and return on ad spend are very high. Brands will get their own reward if they take the time to wade through the range of offerings and see where their ads should be running. Streaming music service Pandora on Tuesday announced the integration of AdsWizz into its platform, giving advertisers the ability to purchase its audio ad inventory programmatically. Pandora’s acquisition of AdsWizz -- which the company acquired in April for $66.3 million in cash and 9.9 million shares of Pandora common stock -- powers the programmatic marketplace, Eric Picard, vice president of product management at Pandora, told MediaPost. The idea is to give advertisers reach into a large set of ad-supported listeners. There are 72 million actively monthly listeners in the U.S.
AdsWizz is one in several programmatic platforms that can deliver audio ads. Google also earlier this year announced the availability of audio ads. Pandora’s audio programmatic feature initially was released in beta this past February. More than 20 brands participated during the test period. Some of those — P&G, Gatorade and Sony Pictures — saw a significant return on ad spend and increases to in-store traffic. Gina Hardy, head of consumer and athlete engagement at Gatorade, did not cite any specific improvements in her release statement, but mentioned the emotional connection gained through sound and programmatic ads. “Based on the music, we can pretty much tell if you’re working out, or in a sad or happy mood,” Picard said, referring to targeting options. Craig Stimmel, who leads digital partnerships at P&G, believes programmatic is key to bringing digital audio into multichannel marketing. It also helps to remove friction from the system that enables real-time optimization for brands to easily find their consumers. The real issue that moved audio advertising toward programmatic is scale. The scale of Pandora’s audience is not always apparent, he said. Overall, users logged approximately 5 billion listening hours on Pandora in the first quarter of 2018 across 2,000 consumer electronics devices, with the average listener tuning in approximately 24 hours per month. Listeners tuning into Pandora on voice-activated devices rose nearly 110% year-over-year, and about 90% of Pandora's total listening hours occur via mobile and other connected devices. A new consumer satisfaction survey released today concludes some non-contract and pre-paid wireless service providers are customer favorites and the big four players — AT&T, Verizon, T-Mobile and Sprint — are not. The survey from consumer experience consultancy Market Force Information concludes Consumer Cellular is “ranked as America’s favorite carrier.” That’s the carrier that gives discounts to AARP members and that also has won or placed highly in other rankings in the recent past. Simple plans, explained simply, also factor in. “In our new convenience economy, ‘simple’ has tremendous value to consumers and those brands that can offer it will prevail in the long term,” Brad Christian, Market Force’s chief customer officer observes. 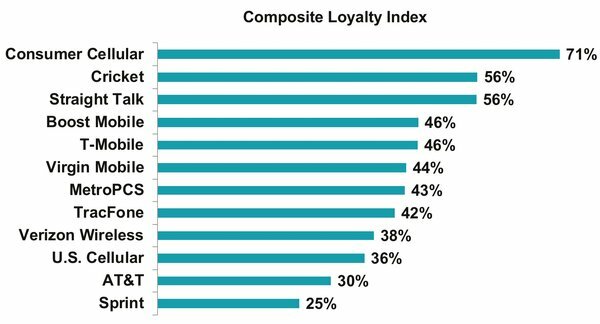 When looking at all of the wireless providers combined, Consumer Cellular earns a Composite Loyalty Index (CLI) score of 71%. Cricket and Straight Talk tied for second place with 56% apiece, and Boost Mobile and T-Mobile tied for third. Meanwhile, Verizon came in a distant seventh, while AT&T and Sprint landed on the bottom of the rankings (as shown in the chart above). Of the big four, T-Mobile ranks first, followed by Verizon and AT&T. Fourth (and last) was Sprint, with which T-Mobile hopes to merge. The survey showed a marked uptick in the number of customers shifting from contract plans with term limits to pre-paid and pay-as-you-go options. “In the past two years, contract plans saw a 15% drop among consumers — from 62% in 2016 to 50% in 2018. In the same period, the use of pre-paid service grew by 7% and pay-as-you-go by 5%,” the report says. Christian tells Marketing Daily the non-contract wave happening in many industries also is in full flower in the wireless business. Christian says the significant high marks Consumer Cellular are worth noting, even if its user base is older than the norm. Cricket, the prepaid wireless provider now owned by AT&T, gets the highest marks for its in-store service, an area Market Force says deserves more attention as wireless technology gets more complicated and customers need more hands-on help. “Cricket is the clear leader across the board, ranking first in nearly every in-store service category, from clearly explaining products and providing information, to taking time with customers and proficiently setting up features,” the report says. “In our research, we have seen that brands can truly damage their reputation when customer service representatives do an inadequate job of explaining the nature of the bill that a customer will receive in the first month,” Christian says. Those first bills with surprise charges create a lasting memory. Financial services executives are sort of like record company execs in the late 1990s. The big difference is that the former know that massive change is coming. Napster eventually paved the way for online music consumption and streaming that upended the way people consume music. But with financial services, the change is coming from more places. New apps make banking and budgeting easier. Millennials also realize they have the power to influence banks to bend to their will. The smart ones are doing so. 1. Millennials are willing to take the nuclear option. Consumer banking has been a “loyalty through default” category. In other words, the high cost of switching banks has prompted most consumers to stay put. But research has shown that Millennials are two to three times more likely to switch banks than older consumers. The primary reasons were negative treatment when they missed a payment and the lack of ATMs and branch locations. Considering that a 20-year-old consumer could become a loyal customer for another 50 years, banks might consider going a bit easier on young consumers who fell behind on a payment or two. 2. Digital banks are waiting in the wings. Just 2% of Millennials were with a digital-only bank in 2016, but 16% expressed interest. Such banks have a huge advantage over incumbents in the category since they don’t have to open physical locations and, by necessity, are more mobile-focused. Though digital banks haven’t made many inroads, research from PwC shows that 46% of consumers prefer to interact with their bank via digital channels. 3. Millennials need help with their finances. The average college graduate in 2016 had about $37,000 in student loan debt, according to higher education expert Mark Kantrowitz. Since the 2008 financial crash was a formative experience, some 42% of Millennials invest too conservatively, according to a Fidelity study. Considering how long their investments have to mature, being too conservative can be a big mistake for Millennials with repercussions that last many years. A recent J.D. Power study showed that 78% of all consumers want advice from their retail banks; Millennials were the most receptive of all to such advice. 4. The old bank model needs a shake-up. It’s now possible to cash checks via an ATM, eliminating a major reason to visit a bank branch. It’s even possible to apply for a loan online and/or via videoconferencing. But most bank branches are still designed for long queues for teller services. Some banks have experimented with new designs. Some CapitalOne Café locations, for instance, look more like a Starbucks or a hip cafe than a traditional branch. These days, consumers want to be able to take care of their daily banking chores via their phones and laptops and occasionally through an ATM. But when it comes time to get a loan or talk investing, they want the human touch. Banks must reinvent themselves to meet these needs. Years ago, a human banker was a trusted member of the community. These days, we have brands instead. Forward-looking financial services brands realize they have an opportunity to remake themselves and ditch the trappings of paper-based banking. Consumers are ready. Banks need to be, too. Agency Gale is expanding its management team with the addition of Adam Heimlich as senior vice president media. In this newly-created role, Heimlich is responsible for driving media planning, analytics and product practices on a global scale. He will report to Gale’s president and CEO, Brad Simms. Heimlich joined Gale from Horizon Media, where he founded the agency’s programmatic practice, HX. Before that, he spent eight years at Razorfish where he led search and performance marketing. Headquartered in New York with offices in Toronto, Singapore, and Bangalore, Gale’s client roster includes BMW, Bank of Montreal, Allstate, MGM, Bain Capital, and T-Mobile. Email marketers flooded inboxes with email during the 2017 holiday season. Volume was 78% above average on Thanksgiving Day, reaching a peak of 122% above the norm six days later on November 29, according to Have Yourself A Merry Email Christmas, a report by Return Path. With that increase came an increase in spam complaints. They hit a rate of 0.9% toward the end of December, compared to an average of 0.17% in 2017. On the positive side, inbox placement for the holiday period ranged between 90.4% and 92.0%, compared with the yearly average of 86.5%. 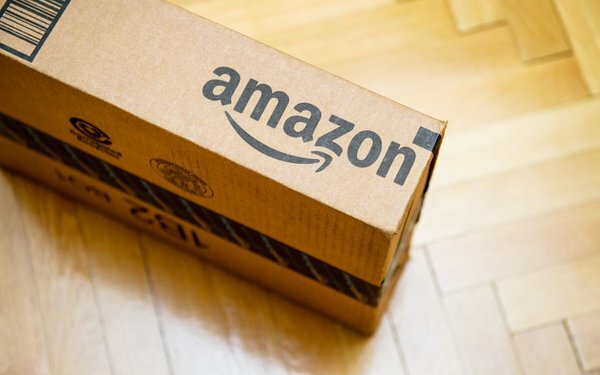 The second-highest volume occurred on November 26, three days after Thanksgiving and one day before Cyber Monday — 106% over average. Despite the increased volume of email in the inbox, subscribers were active during the holiday season. The read rate hit an average of 24%, usually varying between 21% and 25%, compared to 21.5% for the year. It dipped to 23% on Black Friday and to 21% during that weekend, but jumped back to 23% on Cyber Monday. However, it declined to 22% on Christmas Day, only to jump back up three days later. Return Path found that 52% accessed email via mobile, 15% by desktop and 34% by webmail. The highest inbox placement rate on Black Friday and Cyber Monday — 95% — was achieved by the kids & babies and general merchandise sectors. The sporting goods industry had the lowest inbox placement rate on Black Friday — 87% -- but that improved to 89% on Cyber Monday. Nonprofit mailers achieved an inbox placement rate of 80%, vs. 76% for the rest of the year. But the read rate was 15%, compared to 16% for the overall year. At a time when Nielsen appears to be in a bit of turmoil with Wall Street turning cold and its CEO stepping down, a new-and-improved comScore is making new strides in the next generation of TV market players. comScore this morning announced that a new “Campaign Ratings” platform will launch in beta this September and that all the major TV networks and OTT players have signed up to test it, including ABC, CBS, CNN, Disney, Fox, Freeform, GroupM, NBCUniversal, The CW Network, Turner, and Viacom. The new platform, which is powered by Hulu, will “provide media buyers and sellers with trusted, unduplicated measurement of ad campaigns across linear TV, over-the-top (OTT), desktop, and mobile platforms,” the companies said in a statement announcing it. “The measurement gap in advertising has hampered media brands from fully articulating the value of their audiences and advertisers from gaining an accurate understanding of campaign performance,”states Bryan Wiener, who joined comScore as CEO earlier this year from Dentsu Aegis Network’s 360i, where he was founder and CEO. The new platform will include an unduplicated view of total audiences across linear TV and digital platforms, person-level reach and co-viewing insights, and reliable audience demographics. comScore will incorporate feedback from beta partners to iterate on and optimize future releases of the product. A pair of notable news stories over the past week have raised new questions about what video content will look like for younger viewers, and exactly who will control that ecosystem. The rise of mobile video, social video and streaming have already dramatically shifted the way we consume video, but both legacy media companies and new upstarts are betting that these technologies will forge a new set of winners and losers. Younger consumers are not as committed to legacy media channels as baby boomers and Gen-Xers, so the race is on to become the content provider for the next generation. Among the upstarts, few are as flashy or high-profile as NewTV, a project being developed by mogul Jeffrey Katzenberg’s WndrCo. Last week, WndrCo confirmed that it had closed its first $1 billion (yes, with a “B”) round of funding for NewTV, with institutional investors joining companies like Disney and Warner Bros. in the round. NewTV named former Hewlett Packard Enterprise CEO Meg Whitman as its CEO in January, suggesting that Katzenberg had grand ambitions. The billion-dollar funding round backs up that notion. Still, very little is known about NewTV. So far, Katzenberg has really only said that the plan is to produce ultra-premium content (think “Game of Thrones” quality) only short-form and delivered in a mobile-first environment. Exactly where that content will be available remains unclear, and it also isn’t clear whether it will be free and ad-supported, subscription-supported, or both. On the other side of the coin, last week Viacom confirmed it had acquired AwesomenessTV, a company that sought to produce premium content for young viewers. At one point, AwesomenessTV was valued at $650 million. Viacom reportedly acquired the company for $50 million and the assumption of debt. 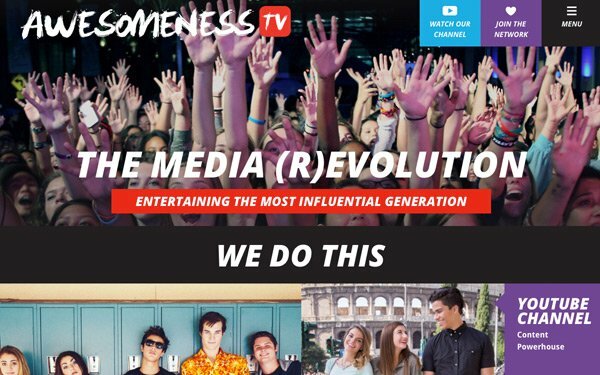 Rather than serving as a warning to NewTV, AwesomenessTV is something of an alternative take on the same idea. While it failed to succeed as a standalone company, Viacom is betting that the pieces it has built will be able to thrive within its Digital Studios unit. WndrCo is betting that a massive influx of cash will give it the runway to turn NewTV into the content hub of the future, while Viacom is betting that its programming smarts combined with AwesomenessTV’s digital savviness can accomplish the same goal. Tomorrow’s video viewer may not be that interested in the brands of MTV or Comedy Central, but both companies are betting they can create something that is sticky, and will resonate with that generation in the same way as Gen-Xers saying “I want my MTV!” 30+ years ago. As digital publishing becomes more refined — how to catch and keep audiences, what content works best for which platforms — so does its efforts to attract the most lucrative advertising to match its demographic. 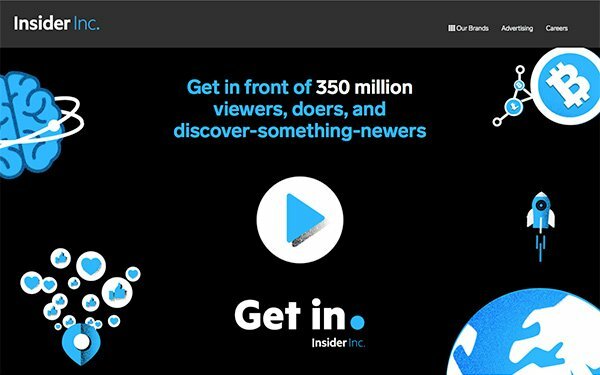 As it continues its campaign as a digital front-runner, Insider Inc.— Business Insider’s newish corporate identity — is partnering with Nielsen to make its audience numbers even more accurate by applying Nielsen’s Digital Content Ratings (DCR) to its portfolio of more than a dozen Business Insider editions and Insider. DCR, which became available for full syndication in 2016, offers outlets access to numbers derived from Nielsen’s census data platform, next-generation SDKs and Cloud API, legacy tools that measure across various screens. The resulting numbers offer more accurate, and useful, person-based demographic daily reporting. In a post on Insider Inc.’s website, the company explained the rational behind its decision to partner with Nielsen. As users reach content across a range of devices, an outlet’s ability to measure its audience accurately has become increasingly difficult. Unique visitors (UVs), which have been the golden standard when assessing audience numbers, were useful when most readers were accessing a site from a desktop computer. However, they have become less so with the introduction of mobile devices, for example. The growth of OTT video viewing has added an additional level of confusion to the mix, the post adds. Through the use of DCR, Insider Inc. discovered its audience was actually larger than previously believed when the numbers came from other audience measurement tools. In June, the company counted 115 million users, making it one of the five biggest media properties for daily and monthly video views. Additionally, the company counts 3 billion video views each month and 21 million U.S.-based viewers every day. The company will use the numbers gained from its partnership with Nielsen to connect advertisers with a brand-friendly environment, offering them a clear path to a digital-native audience at scale. Insider Inc. produces approximately a dozen shows on Facebook Watch and will launch Insider TV, the company’s first OTT offering, this fall, which will be bolstered by the new measurement system.